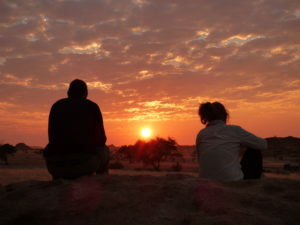 This volunteer experience takes you to the northwestern regions of the Namib Desert, traditionally known as ‘Damaraland’. 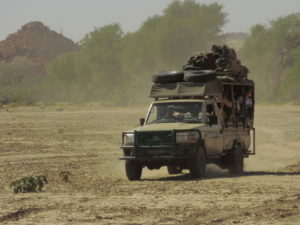 This harsh tribal wilderness area, runs parallel to the skeleton coast national park, and is home to a small population of desert-adapted elephants. The first week of the project will see you working with the local subsistence farmers, building protective walls around their water points, or constructing new water points for elephants away from homesteads and farms. The following week is spent assisting the staff of EHRA in following, and monitoring the movements of these elephants on patrol, camping wild and living close to the earth, elephants and people. 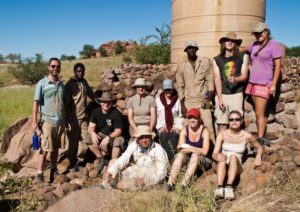 Damaraland is vast, scarcely populated communal trust land. As it is a transitional zone between the high rainfall area in the east, and the Skeleton coast in the west, it is regarded as un-farmable on a commercial basis. 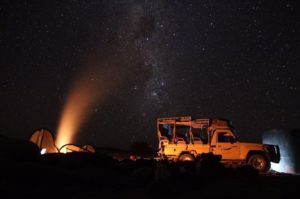 Therefore it has become a natural, unfenced refuge for desert adapted animals such as; black rhino, oryx, giraffe, springbuck, kudu, steenbok, baboon, lion, leopard, cheetah, spotted hyena, brown hyena, black backed jackal and more. These areas used to be inhabited by nomadic bushman hunter-gatherers, of whom there is lots of evidence in the form of thousands of rock paintings and engravings. Now, beyond the fringe of permanent settlements, only nomadic pastoral farmers, and tourists venture. This area is still regarded as one of the last true wilderness areas left on earth! 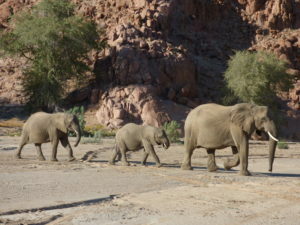 The EHRA project was launched in December 2001 as a result of the escalation in competition for natural resources between the desert dwelling elephants and human inhabitants of the northern Erongo and Kunene regions. EHRA believes that through assisting these communities by constructing protective structures around water points, educating community members about elephant behavior, creating alternative drinking points for the elephants and promoting tourism in the affected areas, we can assist in alleviating the current pressure facing communal farmers. Thereby helping to promote the future of the desert dwelling elephant in harmony with the continuous positive development of the conservancies and their ideals. We set up our mobile base camp at each project site, which we try and make as comfortable as possible! You will be accommodated in two man tents or you can choose to sleep under the stars. Washing facilities are limited but a ‘bushman’ shower may be made available if there is a water dam at the site. Toilet facilities will be in the form of long drops (enclosed and private). Meals are prepared on a rotational basis, over the open fire, and eaten around the campfire together. We supply really good food with adequate vegetarian options, examples would be Spaghetti Bolognese, Roast Chicken or Thai Curry. Transfers are not included but are organized for you by Worldwide Experience. Cellphones are not permitted on the elephant patrol weeks. The reason for this is that some of the areas that we drive through are sensitive black rhino ranges and with the threat of poaching we have made a decision not to allow our trackers or other staff members use their cell phones during this week. This is really to protect EHRA’s good name should a poaching incident occur in an area we have recently driven through. In this light we therefore ask that all volunteers also leave their cell phones back at base camp during this week in the locked facilities. This will mean that you can not use the camera on your cell phone during this week so please make sure you have an alternative. An average temperature during the day should peak around 31C/88F, with nights a dipping to a reasonable 17C/63F. We would advise that you bring a sleeping bag liner as well as your sleeping bag, in case the sleeping bag is too hot. You should also bring a waterproof jacket as it is likely to rain at this time of the year. You will not have much leisure time during your placement but you can always take the opportunity to travel before or after your placement. The first week of the project will see you working with the local subsistence farmers, building protective walls around their water points, or constructing new water points for elephants away from homesteads and farms. The following week is spent assisting the staff of EHRA in following, and monitoring the movements of these elephants on patrol, camping wild and living close to the earth, elephants and people.